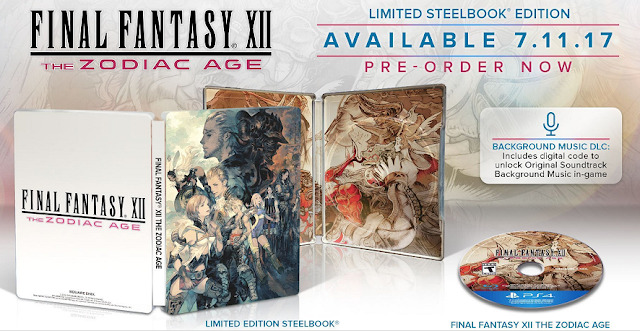 News by Davis A., Matt C., and Britta S.
During its PAX East 2017 panel, Square Enix announced various editions for the regional releases of the PlayStation 4 exclusive Final Fantasy XII: The Zodiac Age. The game's standard physical and digital editions are priced at $49.99 USD, with the physical edition including a reversible cover on first-print copies and the digital edition a four-track music compilation (composed by Hitoshi Sakimoto) and a PlayStation theme. A Limited SteelBook Edition, featuring artwork by Akihiko Yoshida, is also priced at $49.99 and comes with a code to unlock original background music in-game. The Zodiac Age is an HD remaster of Final Fantasy XII: International Zodiac Job System, originally only released in Japan. The game will be released on July 11 in both North America and Europe, and on July 13 in Japan and Asia. 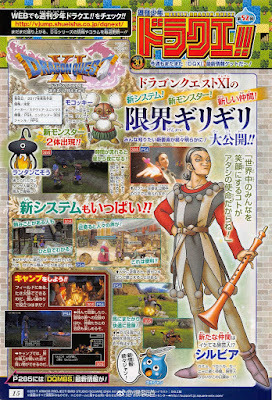 The latest issue of Weekly Jump reveals new information on Dragon Quest XI: In Search of Departed Time, including a new character. Sylvia: “It is my mission to make the people of the world smile!” He is a character who seems to be a traveler, but his tone is…? We also get some new details about the camping system. In addition to resting, healing, and writing in the adventure log (saving your game), you can also enjoy conversations with your party. At camp, you can buy items at the shops opened by traveling merchants. 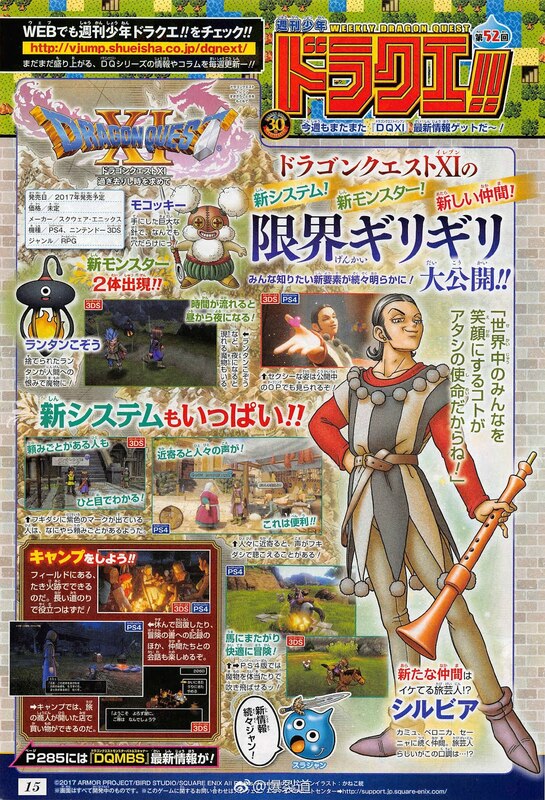 And last but not least, two new monsters were revealed as well. Mokokkii, a monster that carries a huge needle that can fill anything with holes. Lantern Kozou, a lantern that was thrown away and became a monster in its resentment against humans. Follow the exploits of the Go-Home Club, a tight-knit group of Kishimai High School students who've discovered that their lives are nothing more than a virtual charade. They've come to realise that the world they're living in is in fact Mobius, a virtual reality construct created and ruled by an omnipotent virtual idol known as u (pronounced myoo). This ragtag group of students must fight encounters with crazed students known as Digiheads, battle malevolent musicians, confront the almighty u, and face their deepest traumas before freedom is theirs. The story was in good hands with Persona series veteran Tadashi Satomi, as players will need to examine the ugly psychological issues that plague the various characters in the game. The game features a strategic battle system called “Imaginary Chain”. Once enemies are encountered, players will seamlessly transition their party of four into battles where they can choose from 100+ skills to unleash and can see a simulated preview of their attack before committing to it. There are 500+ NPCs to potentially recruit into the party. Each has a preassigned class and a unique background story that’ll slowly be uncovered by completing various quests. The soundtrack features original songs by celebrated Japanese producers — only fitting for a game about fighting musicians! There’s been a lot of talk about the new land vehicles coming to No Man’s Sky, but the latest update adds something far more important: a revamped photo mode. A photo mode was included with the version 1.1 update last year, but its functionality was limited. With the new photo mode, players can adjust camera angles, take a third-person perspective of their ship, adjust the time of day and weather effects, and alter things like cloud layers and fog density. You can also apply a range of filters, including black and white and a GameBoy-like monochrome green. The new photo mode is the result of a collaboration between Hello Games and DeadEndThrills, an artist who’s made a name for himself taking photographic screenshots of games. His No Man’s Sky gallery has some great examples of what the new photo mode is capable of. The Pathfinder update also adds a bunch of – dare I say it – unnecessary new features like buggy racing and “online base sharing”. For those of us who appreciate it for the work of art it was in its original release, though, the new photo mode will no doubt be a welcome inclusion.